Washington junior Shawna Conger puts up a shot over two Waverly defenders during a non-conference game at Washington High School Wednesday, Feb. 6, 2019. 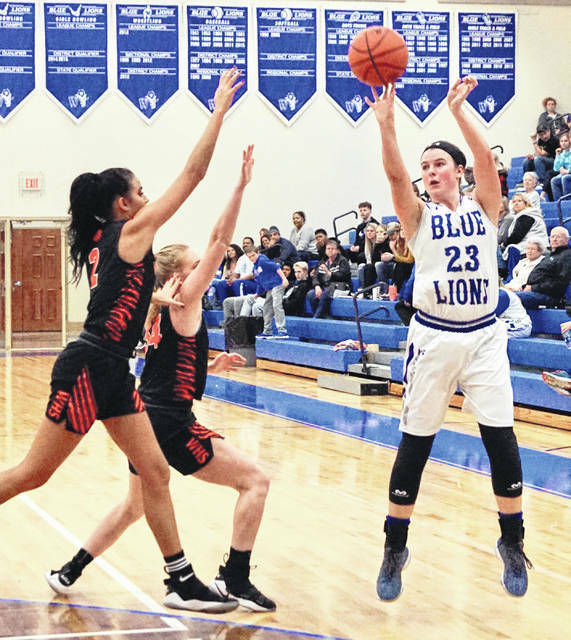 The Washington Lady Blue Lions hosted a team that they will open the Sectional tournament against on Feb. 14, the Waverly Lady Tigers, Wednesday night. Washington came out extremely strong in the first quarter, putting up 27 points en route to a 72-36 rout of the visitors. Washington improves to 16-4 on the season. Waverly is now 12-8 overall. Senior Hannah Haithcock poured in 28 points and pulled down 10 rebounds for another double-double for Washington. To those numbers, Haithcock added five steals. Junior Shawna Conger hit five three-point field goals and scored a total of 19 points. She also had seven rebounds. Senior Tabby Woods had eight points, four rebounds and three assists. Junior Rayana Burns scored six points and also had six rebounds, seven assists, three steals and three blocked shots. Senior Bre Taylor had six rebounds, four assists and two steals. Lydia Brown led Waverly with eight points. Washington was virtually unstoppable in the first quarter, leading 27-8 after the first eight minutes of play. The Lady Lions took a 40-14 lead into the halftime break. Washington won the third quarter, 18-11 and outscored Waverly in the fourth quarter, 14-11 for the 72-36 final. Washington made four of its six three-point baskets in the first quarter. Washington will play at Miami Trace’s new high school gymnasium Saturday at 7:30 p.m. The Lady Lions will wrap up regular season play with a Frontier Athletic Conference game at home against McClain Monday at 5:30 p.m. That will be senior night for Washington’s five seniors: Hannah Haithcock, Kassidy Hines, Tabby Woods, Maddy Jenkins and Bre Taylor. In other scores of area interest Wednesday, Miami Trace beat North Adams, 50-45 and Circleville defeated McClain, 49-25. WASHINGTON — Rayana Burns 3-0-6; Bre Taylor 0-1-1; Kassidy Hines 1-0-2; Tabby Woods 4-0-8; Halli Wall 0-0-0; Shawna Conger 2 (5)-0-19; Hannah Haithcock 12 (1)-1-28; Abby Tackage 2-0-4; Aaralyne Estep 0-0-0; Mia Moats 2-0-4. TOTALS — 26 (6)-2-72. Free throw shooting: 2 of 3 for 67 percent. Three-point field goals: Conger, 5; Haithcock. WAVERLY — Amelia Willis 1-0-2; Kami Knight 0 (1)-0-3; Carli Knight 2-0-4; Maddy Collett 0-0-0; Michaela Rhoads 2-0-4; Lydia Brown 1 (2)-0-8; Raelynn Dale 1-1-3; Delaney Tackett 0-0-0; Zoice Smith 2-0-4; Hailey Robinson 0-0-0; Sarah Thompson 1-0-2; Paige Carter 2-2-6. TOTALS — 12 (3)-3-36. Free throw shooting: 3 of 6 for 50 percent. Three-point field goals: Brown, 2; K. Knight.